Rome/Athens: Italy moved closer to a national unity government on Thursday, following Greece’s lead in seeking a respected veteran European technocrat to pilot painful economic reforms in an effort to avert a euro zone bond market meltdown. After four days of chaotic haggling, former European Central Bank (ECB) vice-president Lucas Papademos was appointed to head an interim crisis cabinet charged with saving Greece from default, bankruptcy and an exit from the euro zone. Sources in Berlusconi’s conparty said he was now convinced it would be better not to call elections at the moment, an abrupt reversal. The billionaire media magnate has agreed to resign within days after parliament approves long-delayed economic reforms demanded by European partners. Political and economic turmoil in Italy has spurred fears of a possible break-up of the euro zone, with borrowing costs for Europe’s third-biggest economy at unsustainable levels and the 17-nation currency bloc unable to afford a bailout. German Chancellor Angela Merkel, Europe’s main paymaster, called for broad political support for reforms in Greece and said she believed Italy was winning back confidence, but political clarity was still needed in Rome. She rejected talk of a possible shrinking of the currency area, saying: “We only have one goal, that is to bring about a stabilization of the euro zone in its current form." 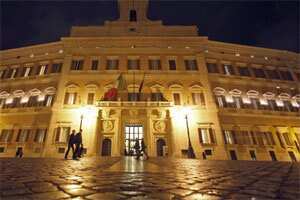 European Union (EU) officials continued to dither and pass the buck on how best to fight the worsening sovereign debt crisis. Three senior ECB policymakers rebuffed pressure from investors and foreign governments to intervene massively as a lender of last resort on bond markets to shield Italy and Spain from rapidly spreading financial contagion. “We have gone pretty far in what we can do, but there is not much more that can be expected from us. It is now up to the governments," ECB governing council member Klaas Knot told the Dutch parliament. Knot, who is also Dutch central bank chief, said bond-buying only had a temporary effect. ECB has bought more than €180 billion (around Rs12.4 trillion today) of peripheral euro zone bonds and traders said it was active again in the market on Thursday, but the purchases have failed to lower borrowing costs durably. Stepping up the scale of bond-buying would eventually force ECB to start printing money with the risk of stoking inflation, which was why the EU treaty had excluded such action, Knot said. ECB executive board member Peter Praet said it was not the task of the central bank to intervene “when there are fundamental doubts about the sustainability of some countries". Outgoing ECB chief economist Juergen Stark earlier rejected calls for the central bank to act as lender of last resort like the US Federal Reserve or the Bank of England. In Brussels, a euro zone official said there were no plans to use the bloc’s €440 billion rescue fund to help Italy, even with a precautionary credit line. “Financial assistance is not in the cards," the official said. A second official said: “ECB will be drawn like every one else by the weight of gravity (to act)." Italian 10-year bond yields steadied at around 7%, a level seen as unquestionable in the long term, due to signs that the political deadlock may be easing. Rome paid less to sell one-year treasury bills than many had feared. But European stocks turned lower in choppy trade. Wall Street pared gains after opening in the green. Asian indices slumped earlier on Thursday a fter an overnight market rout in Europe and the US. Merkel, French officials and the EU’s executive commission all tried to quash talk of a possible shrinking of the euro area, although they raised the possibility last week that Greece might leave the single currency. EU sources said that French and German officials had held informal discussions on a two-speed Europe with a more tightly integrated and possibly smaller euro zone and a looser outer circle. The discussions among senior policymakers, still in the realms of the theoretical, have focused on how to protect the euro zone from breaking up via tighter common policies, which some members may by unable or unwilling to live with. European Commission president Jose Manuel Barroso issued a stark warning of the dangers of a split in the EU. “There cannot be peace and prosperity in the North or in the West of Europe, if there is no peace and prosperity in the South or in the East," he said. Merkel called on Wednesday for changes in EU treaties after French President Nicolas Sarkozy advocated a two-speed Europe in which euro zone countries accelerate and deepen integration, while an expanding group outside the currency bloc stays more loosely connected. The head of the International Monetary Fund, Christine Lagarde, called for political clarity in efforts to tackle Italy’s debt crisis, warning that the world could face a “lost decade" if Europe’s problems were not tackled boldly. A senior Group of Twenty source said the idea of convening an emergency meeting of finance ministers of the world’s leading economies to discuss support measures for the euro zone before the French presidency ends at the end of the year had been dropped. They would meet next in Mexico in February. Euro zone finance ministers agreed on Monday on a road map for leveraging the currency bloc’s rescue fund to shield larger economies like Italy and Spain from a possible Greek default. But markets are running faster than policy and there are deep doubts about the efficacy of those complex leveraging plans, and with Italy’s debt totalling around €1.9 trillion even a larger bailout fund could struggle to cope. Dina Kyriakidou, Angeliki Koutantou and Lefteris Papadimas in Athens, Emelia Sithole-Matarise, Kirsten Donovan and William James in London, and Barry Moody and Alberto Sisto in Rome also contributed to this story.